More than 29 million people in the United States have diabetes and one in four people with diabetes doesn’t know he or she has it. There are two types of the life-long diseases but differ on how the body reacts to insulin. Those with Type 1 Diabetes have a body does that does not make enough insulin, while those with Type 2 cannot properly use insulin. Former NFL player turned ESPN radio host Mike Golic says he wasn’t surprised when being diagnosed with the disease. Golic revealed to California Life his father, a former Canadian football player, also had Diabetes. However, unlike his father, the he decided to go public about living with Type 2 Diabetes and did not keep it a secret. 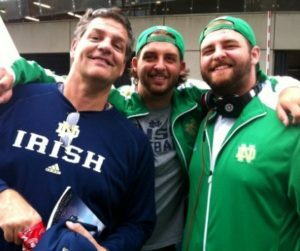 Golic took the game plan mantra to tackle Diabetes by making his doctor the head coach and family members as teammates. A health lifestyle is important to him including regular exercise, eating the right foods and taking medication. Golic says his the new “teammates” are his biggest fans in the game against Type 2 Diabetes. For more on Type Diabetes 2 please see Golic’s campaign at Icanimagine.com. Watch the full interview below for all of Golic tips on living a healthy lifestyle with diabetes. Or tune into this week’s episode of California Life with Heather Dawson airing nationwide. Plus, for more on Type Diabetes 2 see Golic’s campaign at Icanimagine.com.